I liked books about awful things – murder, illness, death. I remember selecting one of the thickest books from the public library, a chronicle of ancient Egyptian medicine, to study the gruesome practice of pulling the brains of the dead out through the nose like skeins of yarn. I liked to think of my brain like that, tangled up in my skull. The idea that my brains could be untangled, straightened out, and thus refashioned into a state of peace and sanity was a comforting fantasy. Her mother didn’t care much about her, and then she died. Eileen has been wearing her mother’s ill-fitting clothes ever since. I sincerely believed that if there were less of me, I would have fewer problems. Perhaps it was for this reason that I wore my mother’s clothes – to be vigilant in my mission never to reach even her minor proportions. As I’ve said, her life, the life of a woman, seemed utterly detestable to me. There was nothing I wanted less back then than to be somebody’s mother, somebody’s wife. Of course, I’d already become just that for my father by the tender age of twenty-four. She lives with her alcoholic father who treats her like dirt. He is also paranoid and delusional. Eileen puts up with her father and delivers his alcohol, hoping it will distract him from picking on her. Their house is a dump. Neither of them cares enough to clean it up. She worries about the way she smells but doesn’t like to have showers. Instead, she just layers up on clothes. People did not chew gum as regularly then as we do now. That was considered very childish. So I kept a bottle of Listerine in my locker and swished it often, and sometimes swallowed it if I didn’t think I could get to the ladies’ room sink without having to open my mouth to speak. I didn’t want anyone to think I was susceptible to bad breath, or that there were any organic processes occurring inside my body at all. Having to breathe was an embarrassment in itself. This was the kind of girl I was. She is stuck in a dreary job at a boy’s prison. She fancies that she’s in love with one of the guards, and routinely scopes out his house (and his nether regions). When Rebecca starts working at the prison, she fantasizes about finally having a best friend. We get to hear a lot about her fantasies and daydreams, some not too abnormal, but some are pretty whacked. All are very entertaining. She is invited to Rebecca’s house on Christmas Eve, she imagines she in for a chummy fun time. But, when she gets there, the usually perfect and wonderful Rebecca is acting strangely and can’t seem to find her way around her own kitchen. The other thing about Eileen is that her insecurities and fantasies are not altogether unrelatable or unrecognisable; I expect you will find bits and pieces of yourself in her. And she is not just a passive observer, watching life happen. She has plans to get out of town and transform herself – she is just waiting for the right opportunity. That’s where Rebecca comes in. Because of all this, I think you’ll find yourself rooting for her despite her oddities – at least, I did. If you find any of this intriguing, then you will like this book. I couldn’t put it down. And, it is not as depressing as it sounds. There is hope and humour in the form of a much older Eileen as she thinks back on this part of her life. She often makes comments about what an odd, prudish girl she was. If I had to describe the book in a couple of words, I would call it delightfully morbid. The story takes place in the week leading up to Christmas, and, although it is not exactly a festive read, there is something appealing about the way the book ends for this time of year. Out with the old and in with the new! Here is the best sentence ever: “People truly engaged with life have messy houses.” I feel vindicated. Hmm, this one sounds interesting to me. I hadn’t heard of it before. It’s good! You should try it. And fast, because I didn’t want to put it down. Oh, boy! That’s a recommendation. This sounds so intriguing! I wonder if I can still squeeze it in before the end of the year. And I have to say, even if you had completely hated the book, I would still read it now because of the BEST SENTENCE EVER. Don’t you just love that sentence?! You could definitely fit it in (depending on what else you’re reading) – it goes fast! It took me 2 1/2 days, which is fast for me. Oooh I so want to read this. Your review has made it even more intriguing! Read it! It’s so good! It does sound very intriguing. 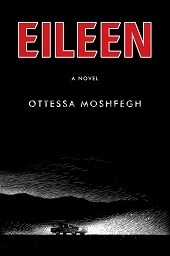 I recall seeing another very positive review of this earlier in the year – is it Moshfegh’s debut novel? She has written a few short stories, and a short novel called McGlue – I would like to read all of them! Intrigued? Definitely… see its due for release in UK next August, will be watching out for it! Sorry. But I love this book and I was really hoping you would too! Eileen’s drive to keep going is so interesting. Her existence was so relentlessly bleak. I wish I could know more about “grown up” Eileen and her marriages. I wanted to know more about her transition to ‘normal’ person, too. Was it quick? Did it take years? I thought that her drive to keep going was refreshing. She must have been a natural optimist under all that awkwardness. Gee, that last quote fits me to a tee. How did she get my number? There were so many good quotes, that it didn’t really matter which ones I chose – they would all have sounded good! At least, that’s how I felt for this book. Sometimes it’s a bit tougher to find the ones I want to use. I think this may be one of your best reviews yet! 🙂 BTW, I love the new look on your blog! So…I can’t decide if I might really enjoy this or not. “Delightfully morbid”…hmmmmm. I admit you’re forever introducing me to previously unknown books and authors! Love it! And yes! The BEST SENTENCE EVER!!! I do agree with that sentiment! Haha! Thanks, Lynn – it was a fun review to write. Maybe I’ll try it again sometime. I find certain books lend themselves to certain ways of reviewing, and that’s just the way it came out. If you want to try something a bit different, I say try this book! I really loved it. You have me so beyond sold on this one! I love how you’ve ever walked this book. Your listicle of Eileen’s undesirable characteristics is most tempting! Thanks. Aargh, I’m not totally bonkers, but my voice activated software is! Ever walked was meant to be evoked – honestly, I do try to speak clearly! I’m glad I’ve tempted you. Thanks for saying so! And for stopping to comment!